Designed to give you safe and reliable power connections anywhere you need it, the Blizzard Drop power box is beautifully simple, quick and easy to use. This reliable and rugged stage power drop box is available in either a PC (powerCON compatible), or TRUE (powerCON TRUE1 compatible) model. Both deliver I/O power thru connections on either end, plus a total of four 20A Edison power outlets. 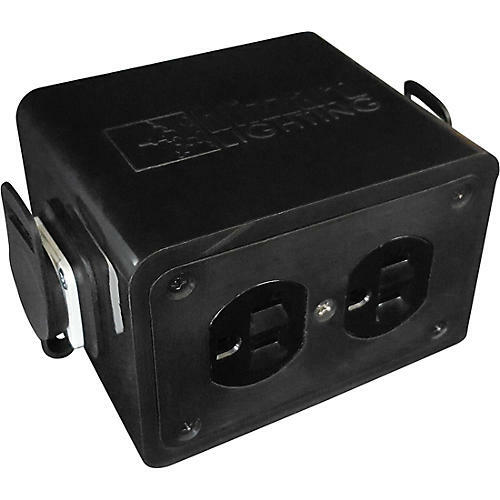 The Drop power box features internal wiring with fully soldered connections, and an extremely tough molded rubber outer casing. Users can power link as many drop boxes as needed for any given application. They are great for any type of stage work, truss work, or any place you need portable, expandable power. There is also a convenient blue LED power indicator on the face of each unit that illuminates when power is being received, so at a glance you will know there is power.